Audemars Piguet made quite a showing at this year's SIHH, with over 40 new references. Coming off the brand's biggest sales year ever, the core collection was broadened with more dial and metal options, including many in yellow gold and two-tone as well. However, the key pieces showcased not only design but also some remarkable new technology. 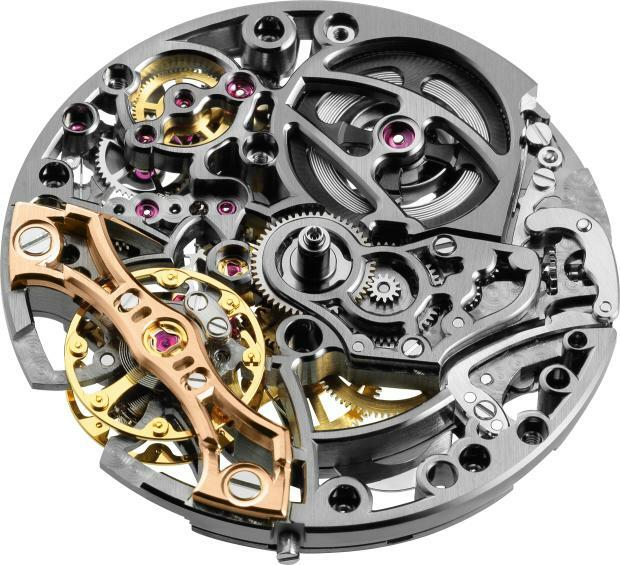 At last year's fair, AP demonstrated the Acoustic Research Royal Oak Concept RD1 Minute Repeater, a prototype that was the culmination of 8 years of acoustic technology research. Using reference repeaters from its heritage collection, they aimed for the SOUND of an AP Split Chronograph from the late 1800s, the TONAL PURITY of a rectangular AP Minute Repeater from 1924, and the SOUND QUALITY ("evenness" of the strikes) of a an AP repeater from 1993. The chiming strikes from the RD1 were even, and there was complete silence in between. This had to be the best sounding minute repeater I have heard. The tonal purity of a top-notch repeater is enough to send chills down your spine. What is different in the case of the Supersonnerie is the patented approach used. First, the sound board--made here from a copper alloy--is isolated from the main plate. When the gongs are attached to a tensioned surface, the sound of the chimes is sequestered in part by that attachment. In the Supersonnerie, the sound is generated in a chamber of its own, isolating the gongs, and is in effect ported by the slotted openings in the caseback. The result is one familiar to any audiophile who has ever heard the sound of Bobby Hutcherson's vibraphone float into the room, seemingly unattached to any projection device. Some speakers are capable of untethering the sound, and the AP Supersonnerie does just that, chiming as though the sound emanates without restraint. 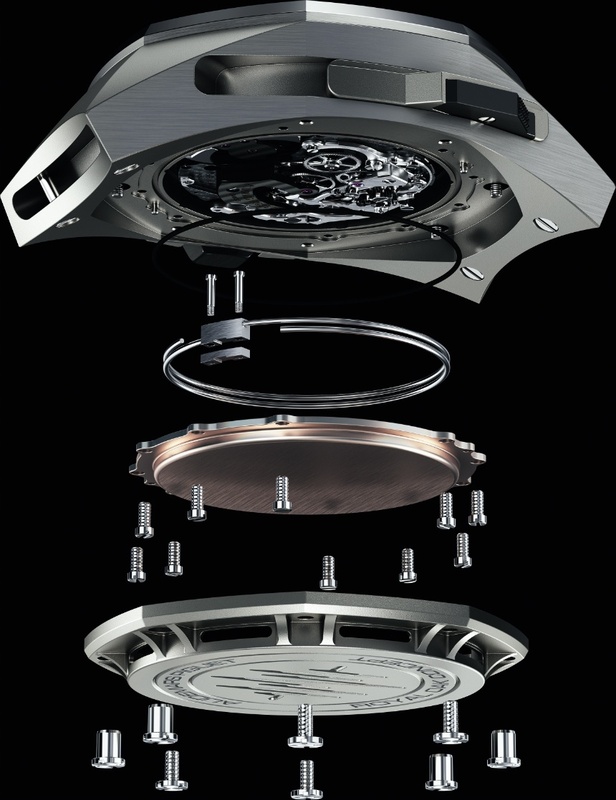 The slots in the caseback could potentially allow water to enter, but without any damage to the movement, which is sealed on the inside of the soundboard. The other remarkable effect of the slotted caseback is that the sound actually becomes louder with the watch on the wrist. Another of the patents found in the Supersonnerie is a curved, flexible regulator, which in contrast to other minute repeaters, actually absorbs rather than imparts sound. The result is silence in between the strikes, versus the typical "whirring" sound of the traditional regulator. This patented regulator measures .08mm--the mere width of a human hair--and was tested without failure for 2 million strikes, the equivalent of decades of use. Because of the isolated sound board, AP noted no appreciable difference in sound when testing with different case material. Featuring both a chronograph and tourbillon, the Royal Oak Concept Supersonnerie is truly a leap forward in minute repeater sound purity and projection. And very well could be the most beautiful AP Concept piece to date. 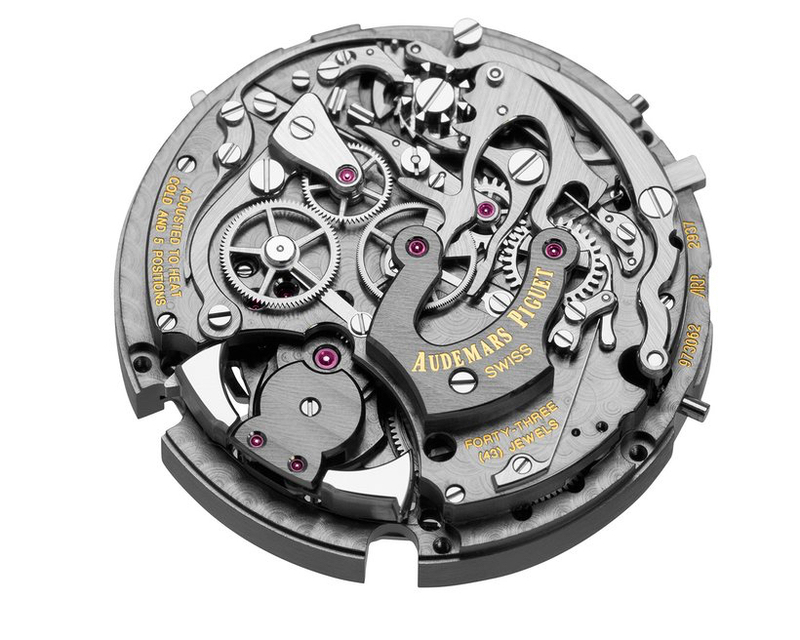 The Royal Oak Double Balance wheel Openworked addresses stabilising issues by fixing a second balance wheel and balance-spring assembly on the same axis. The new "Dualbalance" patented geometry involves a very complex manufacturing procedure, but greatly improves precision and stability. The finishing is impressive, but not ornate. 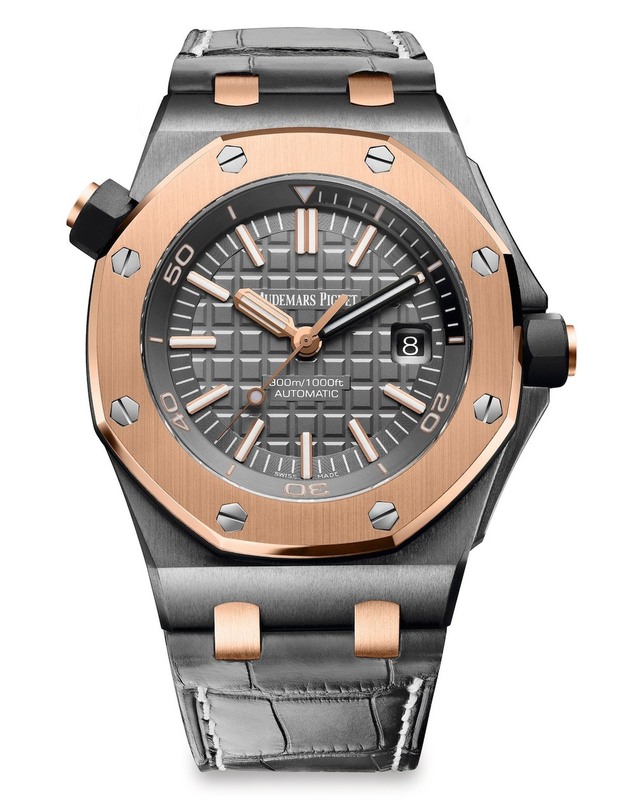 It is also available with a silver dial in yellow gold, rose gold or two-tone rose gold/SS. 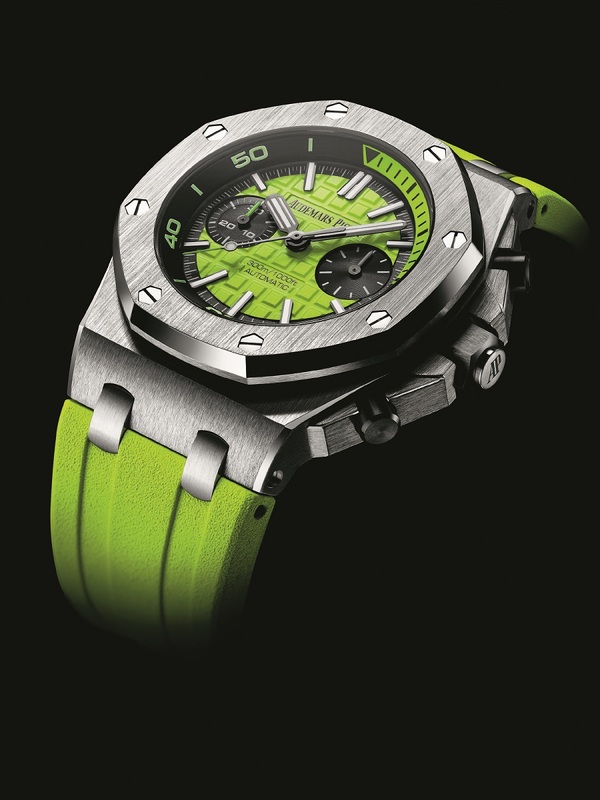 While most of the new collection focused on the classic designs, AP decided to play a bit with the Offshore Diver. Since its introduction in stainless steel/black dial, the piece has been expanded to Forged Carbon, black ceramic, white ceramic, stainless steel/white dial, and even a Limited Edition QEII Cup 2014 with a tantalum case and rose gold bezel. Naturally, the orange, yellow or green versions could be toned down with a black strap, or even the black with orange stitching from the Offshore Volcano. Or a stainless steel Offshore bracelet. There are quite a few additional pieces in the new collection, including 33mm quartz Royal Oaks, Millenary Openworked, Jules Audemars Tourbillon Openworked, etc. I want to thank the entire team at AP for taking the time to share the new collection. Hope you all enjoyed them! 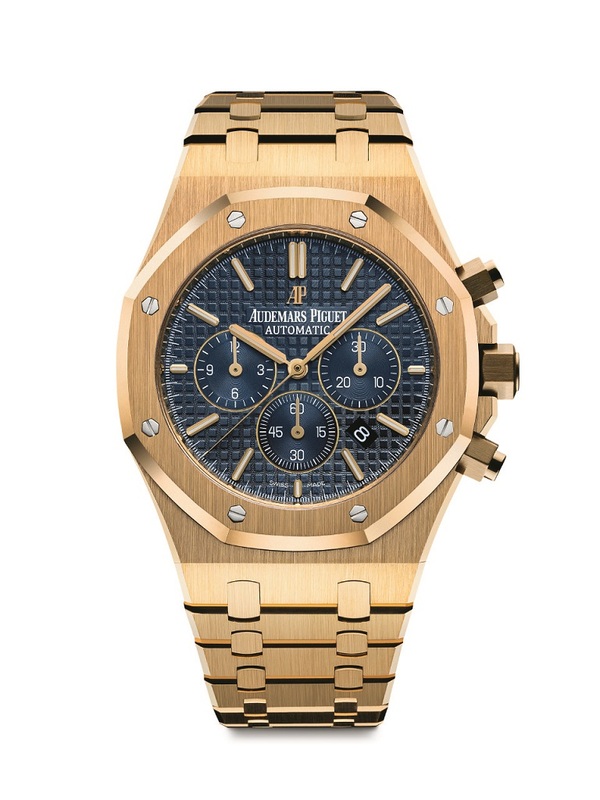 Next Topic: Audemars Piguet Royal Oak ref. 5402: "The Guide"